I recently came across an image that caused me to take pause. 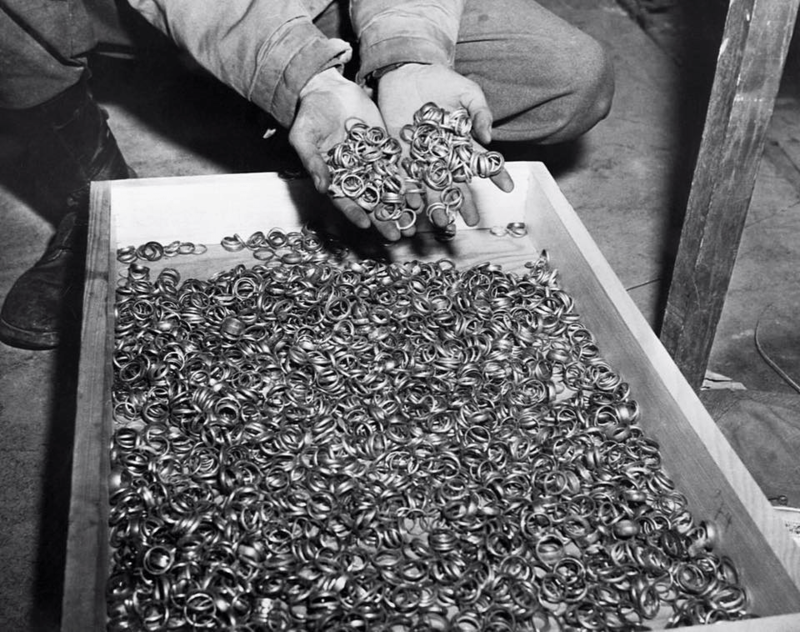 It shows a box full of wedding rings pulled from the fingers of people on their way to gas chambers in Nazi Germany. When I was a kid, my father took us to the Holocaust Museum in Washington, D.C. I remember my sense of awe at being exposed to some of the unconscionable facts of what occurred under Hitler’s regime and trying to wrap my mind around the unique evil against which my great-grandfather fought in the Army during the Second World War. It was an impactful experience and I recommend it to anyone who ever visits the area. I have been back a few times since and I still have the little card I got each time profiling a victim, including the one from that first visit as a child. The most memorable part of that trip was the room completely filled by piles of smoke-stained shoes. Those piles seemed like insurmountable mountains of despair when I was a boy. Looking upon them was like looking upon every face of every person to whom they belonged and I remember the overwhelming realization that some people are capable of acts so heinous as to yield towering stacks of their victims’ shoes. It looked like that scene in the old cartoons where Scrooge McDuck is swimming around in his hordes of treasures except that instead of the bright and shiny results of greed, it was dark and soiled shoes ripped from the feet of children being forced to walk a path no human being should be forced to walk. That is to say, every shoe had belonged to a child. If you have an opportunity to see a museum or marker recognizing the victims of the Holocaust, please go and see it. The awareness that *that* could happen to anyone under the right circumstances is an awareness I think too few people in our society have maintained. The dead are forgotten. Many of them were freemasons like me. 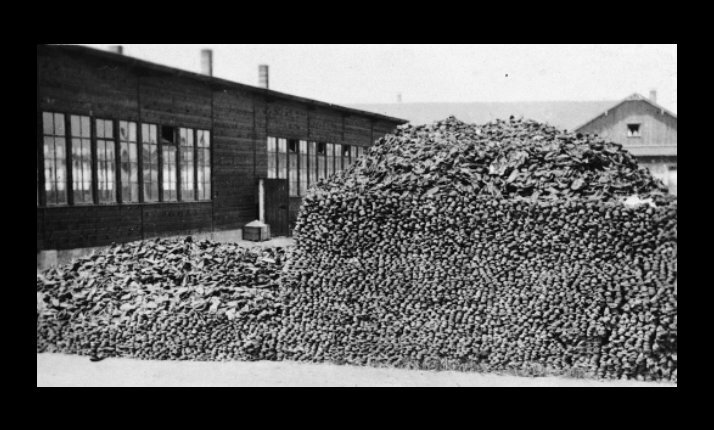 Some estimates say that nearly a quarter million Masons were killed in the camps. They were forced to wear red triangles to signify they were members of a fraternity wherein the main tenets include hope and charity. If you live in central Texas, you live near a remarkable building/museum dedicated to the memory of every Mason who died in WWII. At its opening after the War, the Texas Masonic Grand Lodge Memorial Temple in Waco was designated as a tribute to those lost souls. This museum is open to the public on weekdays during usual business hours and if anyone would like to go and see the exhibits, give me a shout and I’d be happy to facilitate your visit. 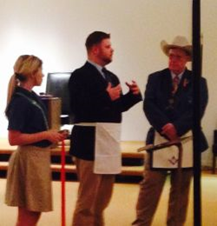 Worth noting: the building is also the home of Texas’ masonic governing body so every year, a significant portion of the 70,000 masons living in Texas sojourn to Waco to meet in the Memorial Temple. 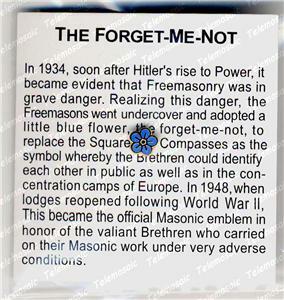 This year marks the 80th anniversary of the German Masons adopting the use of small forget-me-not flower lapel pins to identify themselves as Masons to other Masons without the Nazis determining the signal. I wear a forget-me-not pin on my lapel that was given to me by my friend Tom McGuire who makes the pins to help perpetuate the memory of the victims. It is a small, admittedly effortless way I can signify the sorrow I feel for all my masonic brothers who died unnecessarily in the camps. It is a tiny bit of attire that reflects the memory of when I first saw the terrifying mountains of attire that was stripped off the feet of helpless children on their way to die. Our fraternity is not invincible. We have been targeted by society in the past and we will be targeted again. Look to the current news in the UK if you think it cannot happen again. I pray we find a way to sustain the legacy of all those who came before us and the many who lost their lives simply for having made three distinct knocks in search of enlightenment. One way to prevent such catastrophes is to make our neighbors, coworkers, friends, and family aware that we are masons; help them see that real people in their lives who they respect are members of this ancient fraternity. Then, when some nutcase comes along telling them that masons are out to rule the world or conspire against them, the people in your social circle will have a reason to reject those accusations. Maybe, then, our children will get to keep their shoes. Bro. Ramsey, thank you for the kind words. I hope your presentation was a success. Let me know next time and I will make a visit!